Is it an evil doctrine to say that Christ has fulfilled all of his promises to Israel – in the church?? As we begin to bring this study of Replacement Theology to a close, it is critical that we take another, closer look at some of the things that Paul says, as they relate to his eschatological hope and his view of Israel and her promises. Let me simply give here a few of the passages from Paul’s own sermons in which he explained his gospel, his eschatology, his hope. “Men of Israel, help! This is the man who teaches all men everywhere against the people, the law, and this place; and furthermore he also brought Greeks into the temple and has defiled this holy place” (Acts 21:28). “For we have found this man a plague, a creator of dissension among all the Jews throughout the world, and a ringleader of the sect of the Nazarenes. He even tried to profane the temple, and we seized him, and wanted to judge him according to our law” (Acts 24:5-6). Now, if Dispensationalism is correct, and that the kingdom had been postponed, Israel (temporarily even) set aside, then it surely seems that the accusations against Paul were accurate! Why didn’t Paul tell them that their kingdom expectations were now in abatement? Why didn’t Paul respond to their charges by saying, “Brethren, you don’t understand. You had your chance to accept the kingdom, and your rejected it, so now, I am telling you that your failure has led to God temporarily replacing you with this thing called the church! I know you have never known of it, and I know it was not any part of God’s promises to us, but, because of your rebellion, God has established this “church” and will work with it until sometime in the future (who knows when?) when He will turn back to Israel”? Dispensationalism posits a double Replacement Theology! “And they neither found me in the temple disputing with anyone nor inciting the crowd, either in the synagogues or in the city. Nor can they prove the things of which they now accuse me. But this I confess to you, that according to the Way which they call a sect, so I worship the God of my fathers, believing all things which are written in the Law and in the Prophets. I have hope in God, which they themselves also accept, that there will be a resurrection of the dead, both of the just and the unjust.” Acts 24:12-15). Note carefully what Paul said. The Jews accused him of preaching against Moses and the Law– in other words, against the hope of Israel. Paul said that his eschatological hope was from Moses, the Law and the prophets. It is critical to note that per the Dispensational view, Paul could not be, in any way, preaching the hope of Israel found in Torah, because that hope had been deferred, postponed and delayed. And yet, here was Paul, saying that his gospel message was taken directly from Torah! He neither wrote or uttered one word about Israel’s failure. He said not a word about the kingdom offer being postponed. He did not hint, or suggest, in the slightest manner, that the church was a temporary replacement for Israel until the “right time” arrived for God to resume His dealings with Israel. Paul had one message– taken from Torah. He had “one hope” (Ephesians 4:4f), and that one hope was found in Moses, the Law and the prophets! Paul knew nothing of a Replacement Theology, wherein Israel’s promises failed, or were postponed temporarily. Remember that we demonstrated above that the apostle said, unequivocally, that the remnant of Israel was, when he wrote, receiving what Israel longed for. Now, since what Israel longed for was found in Torah, and since what the remnant was participating in was the body of Christ, it therefore follows that the body of Christ – the church – was in fact the hope of Israel! Notice now what Paul said. 1. He proclaimed the “mystery of God,” by the authority of God. 2. He said that mystery was “kept secret since the world began” but was now, through him, being revealed. The Dispensationalists tell us that what Paul means here is that the mystery was not to be found in the OT. But that is not what Paul said. 3. Paul said that he preached the mystery of God from “the prophetic scriptures.” That is a direct reference to “Moses, the Law and the prophets”! Since Paul said he preached the mystery of God from the Old Testament prophetic scriptures, then if the Dispensationalists are right in saying that the mystery was never foretold anywhere in the OT, was Paul wrong? Was Paul mis-using the OT prophecies when he preached the mystery? Was Paul a perverter of the OT prophecies? If the mystery of God was not in the OT scriptures then the only way that Paul could preach the mystery of God from the OT scriptures is for him to pervert the OT! It is clearly and irrefutably wrong to say that the church, the mystery of God, was not foretold in the OT. It is patently false to say that the church was not the hope of Israel. 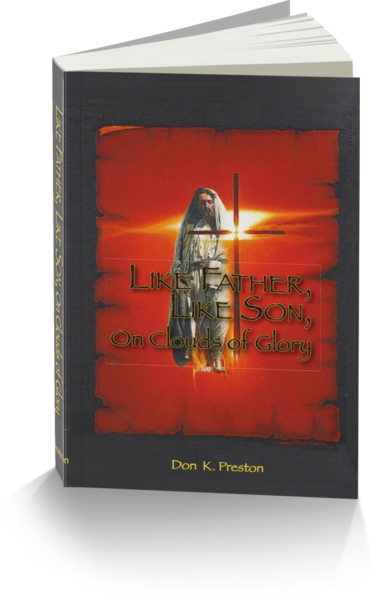 It is clearly wrong to say that Paul preached a postponed “hope of Israel.” See my book, Like Father Like Son, On Clouds of Glory, for an excellent study of God’s faithfulness to Israel! This book shows that the church was always the eternal purpose of God! Paul, Replacement Theology and “nothing but the hope of Israel! Do you catch the power of what Paul said? Paul said he preached “nothing” but what Moses and the prophets said! That means that since Paul was preaching Jesus and the his church, that he was preaching that from Moses! Note that the calling of the Gentiles was Paul’s ministry. (Remember that Peter said that all of the prophets foretold the calling of the Gentiles, as we have shown above). But, the calling of the Gentiles, per the Dispensational paradigm, was proof positive of the postponement of the kingdom and the temporary Replacement Theology! But, Paul knew nothing – absolutely nothing – of that doctrine! He said his gospel was nothing but what Moses and the prophets foretold. So, when Paul affirmed that he preached nothing but the hope of Israel found in Moses, the Law and the prophets, and he preached Christ and the church, then the Dispensational charge against non-Dispensationalists of a negative Replacement Theology is totally falsified. When the Dispensationalists posit a temporary replacement of Israel, to be ultimately followed by the final replacement of the church, this is absolutely contrary to what Paul said. Paul did not preach or teach that kind of Replacement Theology. He preached Fulfillment Theology! Next Next post: Exciting Announcement| Preterist Pilgrim Weekend Coming Up!